My husband and I started making pizza from the time we were married, but there is a big difference between our pizza then and now! We used to buy the box of pizza mix, but after we started baking our own bread from scratch when our first child was still a baby, we realized that we could easily make our pizzas from scratch. As our children grew up, they gradually took over more and more of the pizza-making responsibilities until they were solely responsible for it as teenagers. As early as age five or six, however, they were using a butter knife to slice fresh mushrooms for the pizza. Our pizza dough recipe is below. 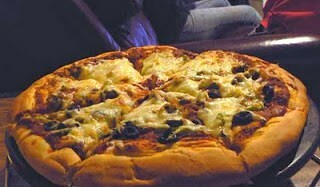 Depending upon the toppings you choose, you can make your pizza as healthy or as decadent as you like! Mix all of the above ingredients in a bowl until it forms a ball and doesn’t stick to the sides of your mixing bowl. I usually use a stand mixer with a dough hook, but for years, we did this by hand. Letting it rise is optional, but doing so for 30 to 60 minutes will make the dough easier to work with. Divide the dough in half. Stretch and roll out each ball of dough on your pizza pan. For years, my favorite pizza pan was a stone, but a few years ago I bought a cast iron pizza pan, and it totally stole my heart as it makes an even crispier crust. Cover your dough with the sauce and toppings of your choice. Whether you use a jar of all natural pasta sauce or your own canned pizza sauce made with homegrown tomatoes and vegetables, this is so much better for you — and less expensive — than take-out pizza. Bake for 20-25 minutes at 400 degrees. 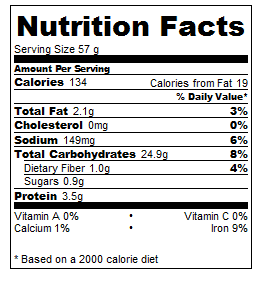 *Note: These Nutrition Facts reflect a single serving of crust, assuming you cut each pizza into eight slices. The toppings you include will make a difference both as to calories and nutrients.